How do you train your children to sleep diaper-free? Dot is already diaper-free during her waking hours, we are still trying to train her to be off the diaper during her sleep. The worst thing is that there were a few times that I forgot to put on her diapers when she was napping. To prevent Dot’s bed from getting wet, I even tried making our own waterproof mattress protector by sewing together the comforter and the waterproof material I bought at Spotlight. It can prevent seepage but it can be quite warm for an afternoon nap. So far, Dot only woke up once in the middle of the night and asked me to bring her to the toilet. Recently, I started to train Dot to sleep diaper-free during the day. 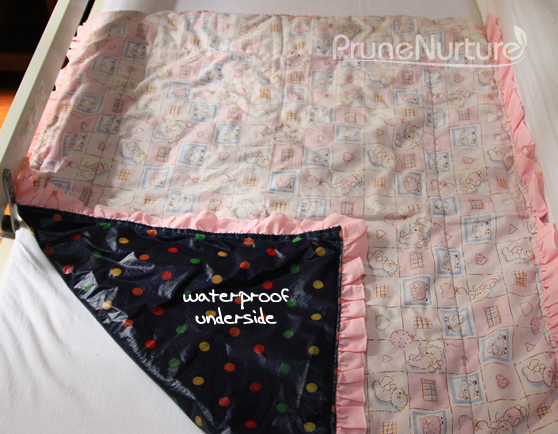 I use Pupsilk DreamMat mattress protector (0.7m by 1m) under the bedsheet of Dot’s junior bed (see images A and B below) so that Dot will not kick off the protector while she is sleeping. Before she sleeps, I will instruct her again that she needs to wake up on her own to go to the toilet. As expected, she wets her bed, wakes up on her own and walks to me. The good thing now is that after using Dream Mat, the mattress is still dry and clean and I only have to wash the bedsheet. The protector is thin and soft to touch and surprisingly very absorbent. It absorbs water very quickly and the underside membrane prevents the seepage. Would love to learn a few practical tips from you on how to train a child to sleep diaper-free if you have any to spare. A close-up view of the water-proof underside of Dream Mat mattress protector. 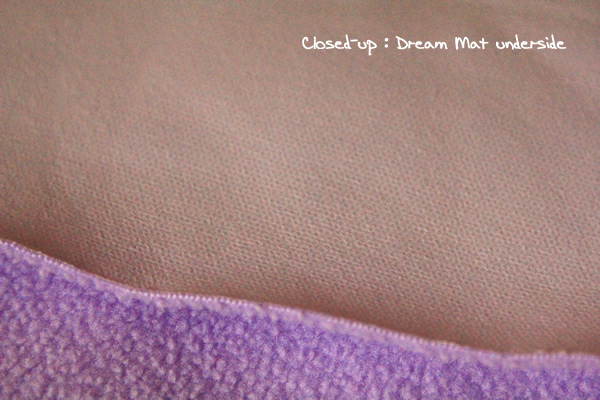 Dream Mat can be purchased online at Pupsik Studio for $25.90. The super absorbent waterproof mattress protector comes in two sizes – 0.7 x 1 m (Dream Mat) and 0.9 x 1.9m (Dream Fit). You now can enjoy a 20% discount by just simply entering “DREAM” under the discount code at checkout, valid till end September 2013. Want to win this Dream Mat? Simply leave a comment on this post on why you love to win this Dream Mat . The winner will be announced on 5 July 2013 on Prune+Nurture Facebook. Only applicable for residents staying in Singapore. Disclaimer: I received a free Dream Mat mattress protector for product review. No monetary compensation is given. My daughter needs to be diaper-free at night!!!!!! I have yet to get my daugther diaper free but with the boys I woke them up 2-3 times a night in the when I was diaper training them. I’d love to win to keep my crib mattress dry and clean! I can’t win because I’m not in Singapore though!!! Sounds really useful. I hope to have this when I let the girl go diaper free through the night,I thunk she is quite ready because on some days she wakes up with a dry diaper and go straight to pee. Still, accidents happen and a protector would be handy!! These are some things I tried. Get dot to go to the toilet before she sleeps and once before you sleep (if you sleep later than her). Somehow, making her wake her to pee made her more aware and she asked to go to the toiler after that. And slowly from there, she cut down and has been diaper less since early this year. But every child is different and it’s important that they are ready to be diaper free. This will be very useful when I need to train my boy to be diaper free. With this I do not need to worry about him wetting the matteress. My son is still on diapers when he naps or sleeps at night. But everytime before wearing the diapers for him, we’ll instruct him to pee in the toilet first. And sometimes, he’ll wake up to a dry diaper. So hopefully, with this protector sheet, I’ll be more brave to get him to really go diaper free and prevent any accidents! It will be very useful for my kid who still occasionally wets his bed. I planned to toilet train my girl soon. Before I start it is important to get ready the necessary item. After I get to know about “Dream Mat” mattress protector from your Facebook sharing, I am sure that”Dream Mat” mattress protector is a must have item in my preparation list! Thanks for sharing! I’m about to start potty training my 2.5yo and this would be mighty handy in keeping me sane, especially during nighttime training! !